The New South Wales Waratahs, also referred to as HSBC Waratahs or simply the 'Tahs, are an Australian rugby union football team, representing the majority of New South Wales in the SupeRugby competition. The Riverina and other southern parts of the state, are represented by the Brumbies, who are based in Canberra and owned by the ACT and Southern NSW Rugby Union. 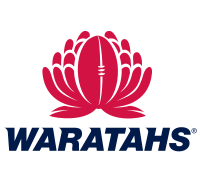 The Waratahs has historically been the name for the New South Wales Rugby Union (NSWRU) representative team, and became the name for the New South Wales team when it entered the Super Six, Super 10 and Super 12 competitions. The name and emblem comes from the waratah, the state flower for New South Wales. Their home ground is Sydney Football Stadium at Moore Park in Sydney. The New South Wales Waratahs play in a sky blue jersey and navy blue shorts, blue having a long sporting association with the state and a famous rivalry with the red/maroon colour of Queensland. Long time sponsors HSBC feature on the front of the jersey. An alternative white strip is also used. In pre-season of 2006, the Waratahs donned a New Jersey scheme in a trial game against the Crusaders. This system saw traditional rugby playing numbers on the back of jerseys replaced with the initials of the player. The current jersey is made by Canterbury of New Zealand (with the manufacturers logo covered until 2010) and is Cambridge blue, with the alternate strip being white with navy piping. Up until 1885, New South Wales wore 'heather green' strips. From 1891 to 1897, New South Wales played in scarlet jerseys. The following season they team adopted Cambridge blue jerseys. The light blue jersey and navy blue pants were established in 1897 and have been in effect ever since. The New South Wales rugby union team have historically been known as the Waratahs, the flower, the Waratah, being the state flower of New South Wales.